Plein air painting is a method that has been used by the masters for centuries. That alone can make it seem intimidating. We're here to help you demystify the outdoor painting process. We'll also show you how painting en plein air will help you improve all aspects of your artistic work, including your ability to paint colour and light. Plein air painting isn't just for serious artists – it's for anyone who wants to get out in nature and have some fun. 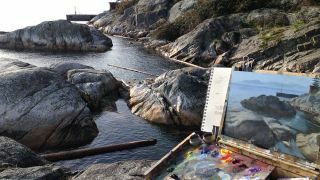 In this article we'll start by explaining what plein air painting is, then offer some advice for getting started. This section will look at the keys to composition and how to hone your observational skills. Click through to page two for some specific advice on capturing moving scenes, and jump to page three for a run-down of all the gear you need. What is en plein air painting? Painting en plain air is the practice of painting outdoors, capturing people, landscapes and scenes in natural light – rather than painting indoors from reference sketches, photographs, life models and so on. Painting outside became popular with the French Impressionists. It was made possible with the invention of transportable paint tubes and the plein air easel, and involves a unique set of challenges, skills and techniques. Plein air painting is suitable for any medium, but gouache paint is water-soluble and quick-drying, so is a good one to try. Work small, usually around 5 x 7in, and always start with the biggest brush, such as a 1-inch flat. Work down to small brushes as you get into details. A hot press illustration board is ideal for gouache. Both urban and natural settings offer a wealth of great subjects to paint, and you will be able to practise and learn the same amount from either. Do you like privacy when you're out creating your art? If you aren't comfortable with strangers commenting on your work then you probably want to head deep into nature and avoid busy streets. A good tip is to wear headphones if you want to avoid chatting with passers-by. On the other end of the scale, you could carry business cards in case people are interested in purchasing your paintings. Once you've picked a location, scout the area for a subject. Look for great lighting, but keep in mind that it may change quickly. Also consider how much time you have – don't pick something complicated if you only have 30 minutes to paint. Don't be afraid to focus on small subjects like a flower. It's a good idea to snap a photo of your subject when you first start to paint, in case you want to finish at home. A great plein air set-up will put all of your supplies at your fingertips. Your pochade box should be able to hold your paper or canvas, as well as a palette, towel, water, brushes, and at least a few tubes of paint. You don't want to interrupt your flow every few minutes to dig up a brush or colour. Pour out plenty of paint and mix any major colours you need before you get started. Your composition is perhaps the biggest factor in whether or not you create a successful painting. Use your fingers to form a viewfinder to frame your subject, then transfer the framing to your canvas as quickly as possible in a simple pencil sketch. Using the rule of thirds and avoiding tangents will go a long way to getting a decent composition. Try painting with the largest brush possible, for as long as you can. This will help you to see shapes instead of details, and will make you focus on the overall colour and value relationships of the image. We demonstrated this technique in depth in our Capture natural light in your paintings post. When you feel like you simply can't get the detail you need with the large brush, jump down to a slightly smaller one, but avoid hairline brushes for as long as you can. One of the most common problems for beginners is properly identifying colours. It's a lot harder than it sounds! We all know red from blue, but when you begin to get into the muddy world of browns, greys, and purples, things get a lot more complicated. Shadows can be warm, light can be cool... there are no hard and fast rules, just try to observe and exaggerate colour when necessary. Not every painting you do will be a masterpiece, but that's how you know you are pushing yourself. It's important to leave your ego at home and take some days to mess around. Try a new brush or a different type of paint. Set up a page of tiny thumbnails to study colour relationships. Try working big. Try mixing media. Find out what works best for you. It would be wonderful if we could spend all day painting outdoors, but chances are you will have a limited window of time. A couple of hours is enough to create a painting that captures all the major elements of most scenes. If you know you only have 30 minutes, you can approach things differently and might even be pleasantly surprised at how much looser and more alive your work feels with limited time.